I tell you one thing, Ms. Martha sure can come up with good recipes. Or else, perhaps, the food people she hires can. I made a batch of these magic blondies for a coworker’s birthday earlier this week and they were such a big hit! Super simple and super yummy (yes, I snuck a bite of Tony’s, shhhhh!). I’ll have to make another batch sometime next week after the holidays. 1. Preheat oven to 350. Line a standard 12-cup muffin tin with paper liners; set aside. 2. 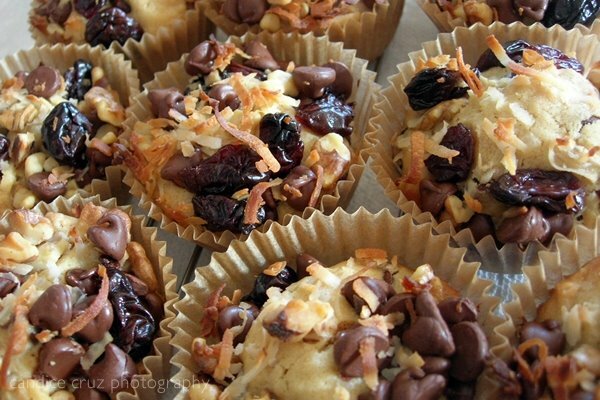 Stir together coconut, chocolate, walnuts, and cherries in a medium bowl; set aside. 3. Whisk together flour, baking powder, and salt in a medium bowl; set aside. 4. Put butter and sugar in the bowl of an electric mixer fitted with the paddle attachment; mix on medium speed until pale and fluffy, about 3 minutes. Add eggs and vanilla; mix until combined. Reduce speed to low. Add flour mixture, and mix, scraping down sides of bowl, until well combined. Mix in 1 cup coconut mixture. 5. Divide batter among muffin cups, filling each about three-quarters full. Sprinkle remaining coconut mixture over tops. 6. Bake blondies until a cake tester inserted into center comes out with a few crumbs but is not wet, about 25 minutes. Blondies can be stored in an airtight container at room temperature up to 2 days. And here’s snapshot of how they turned out. Enjoy!! This entry was posted in magic blondies, Martha Stewart, recipe by shortcakescraps. Bookmark the permalink.